Also, due to the existence of various devices that have watch-like form factors, but are not meant to be worn as watches, I’m going to restrict this discussion to wrist watches. So, this is part 1, which means that we’re starting from the beginning of smart watch history. Given the definition I gave above, the first smart watch would almost certainly be 1940’s Mimo-Loga, which added the C and D logarithmic scales from a slide rule to the watch’s bezel, adding calculation functions to the wrist watch, which would later become a standard of “aviation-style” analog (and the occasional digital) watches. That said, these are purely mechanical watches, with no actual processing power – the actual calculations were done by the user, and the scales on the slide rule were essentially a lookup table. While slide rule watches are certainly interesting, they’re not much more than a curiosity as far as the history of the smart watch is concerned, and there’s already an excellent history of slide rule watches online, written by Art Simon. However, slide rule watches are still somewhat relevant to this history. Just as the slide rule begat the pocket calculator, the slide rule watch, with the transition to quartz digital watches, begat the calculator watch. 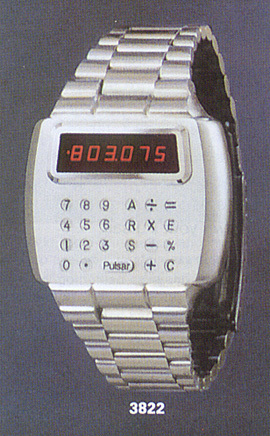 Pulsar, who brought out the original LED digital watch in 1972, brought out a calculator watch in 1975. While there are references to a “Calcron” that came out earlier, it appears that the Calcron may just be a wrist calculator, with no timekeeping functions. 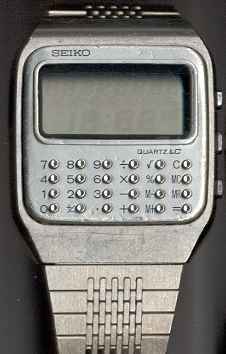 Other manufacturers also made calculator watches, including the Uranus (which had finger-friendly buttons, instead of Pulsar’s tiny buttons that required the use of a stylus), and HP’s HP-01 from 1977, which added the ability to perform time calculations – including connecting the stopwatch to the calculator, possibly making it one of the smartest “pure” calculator watches ever produced. Sinclair also brought out a wrist calculator kit, but it did not have any timekeeping functions. Unfortunately, all of these watches used LED displays, which had rather high power consumption. LCD technology was the answer, and the Japanese jumped on it very quickly. One of the first LCD calculator watches (which have been covered extensively on PocketCalculatorShow.com’s Nerd Watch Museum), the Seiko C153, came out in 1977. The Japanese would quickly dominate the calculator watch market, with Citizen and Casio getting in the game as well, and to this day, Casio still produces one of their 1980’s calculator watch designs, the CA53W-1. So, with an always-on display that could be customized to whatever pattern the manufacturer desired, and available processing power capable of performing arithmetic, watch manufacturers soon branched out from the basic calculator watch. 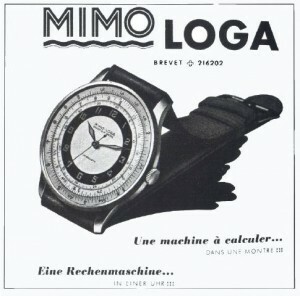 The first application of the technology, beyond calculator watches, was gaming watches – watches that had games built in. One of the earliest gaming watches was 1977’s DataTime Casino Game Watch, featured in the Nerd Watch Museum. Later, Casio and Armitron would get into making game watches. In addition, musical watches began coming out around in the early 1980s. However, while these watches had local processing power, and functions that were completely unrelated to their timekeeping functions, they weren’t really all that smart – everything they did was self-contained, they had no communications, they didn’t have any meaningful data storage, and the functions that they left the factory with were the functions that they had for life. Next entry, I’ll start posting about the even smarter watches that came out in the 1980s.